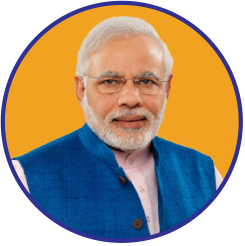 Prime Minister Narendra Modi led NDA government’s primary emphasis has been on accelerating growth through a series of reforms in various sectors of the economy. These reforms are giving impetus to the economic growth and are strengthening the development trajectory of the nation. Make in India is transforming India into a manufacturing hub covering 25 target sectors. India is now the second-largest mobile phone producer in the world, thanks to ‘Make in India’. To get a sense of the phenomenal growth, there were only 2 mobile phone manufacturing units in 2014 and this expanded to 120 mobile phone manufacturing units in 2018. 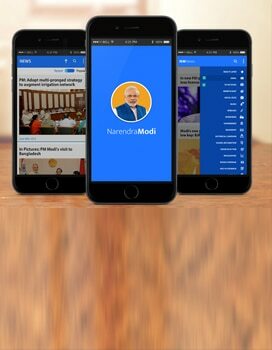 Recently, world’s largest mobile factory was inaugurated by PM Narendra Modi in Noida, which has a capacity of employing a large work-force in the single unit. If we look at the number of mobile handsets produced, the manufacturing stride is enormous – from 6 crore mobiles manufactured in India in 2014, the number jumped to 22.5 crore mobile units in 2017-18. India made mobiles worth Rs. 1.32 lakh crore in 2017-18, a significant rise from Rs. 18,992 crore in 2014. Make in India is creating employment opportunities and attracting record foreign direct investment. FDI increased to a record 61.96 billion US dollars in 2017-18. Increased investment means more jobs and more impetus to growth. PM Narendra Modi led NDA government is committed towards strengthening MSME sector which employs millions of Indians and also has the potential to employ more. Launched in 2015, the Pradhan Mantri Mudra Yojana (PMMY) was introduced to cater to entrepreneurs (mostly MSMEs) by providing them access to collateral-free bank loans. Currently, more than 13 crore small MUDRA entrepreneurs have received capital of about Rs 6.2 lakh crore under MUDRA. Interestingly, about 3.49 crore new enterprises have been benefited in a span of 3 years. Also, more than 70 percent of the MUDRA beneficiaries are women. Giving a push to socio-economic empowerment of the underprivileged, more than 50 percent of MUDRA beneficiaries belong to the SC/ST/OBC sections of society. With an intent to push the growth of medium-sized enterprises, companies which have an annual turnover of more than Rs 50 crores up-to 250 crores, will now have to pay corporate tax of 25 percent, lesser than the earlier rate of 30 percent. The reform driven approach of the NDA government caused a transformative change across sectors in the country. Numerous reforms undertaken in last 4 years include banking reforms, tax reforms, specific sector reforms and reforms ensuring ease of living for the common man. NDA government introduced the Insolvency and Bankruptcy Code (IBC), to take care of the legacy issues like the ever-increasing NPAs. IBC is paving the way for debt resolutions and freeing the banking sector from NPAs, thereby improving the health of banks. Re-capitalisation of PSBs through an infusion of Rs 2,11,000 crore to support credit growth and job creation is another major banking reform undertaken under the NDA government. Also, NDA government approved the route through which amalgamation of various PSBs into a single entity can happen to further consolidation. Passing of Goods and Service Act (GST) is one of the landmark tax-reforms undertaken by the NDA government. The government built a consensus around GST, took states into confidence, and GST was passed in 2017. It is successfully being implemented across the country. Small traders and consumers will be benefitted by the reduction of multiplicity of taxes. With no cascading effect and reduction in transport prices, the ultimate consumer will benefit from the lower prices. A major emphasis of the NDA government has been on increasing tax compliance and widening the tax base. In last 4 years number of ITRs filed have seen a 80.5 percent jump from 3.79 crores filed in 2013-14 to 6.84 crores filed in 2017-18. Apart from banking and tax reforms, there have been reforms undertaken which would benefit specific sectors but would have effects across sectors in the economy. Commercial coal mining has been opened to private players. Around 89 coal mines have been allocated to players through a transparent resource allocation process. Of these 89 coal mines, 31 have been allocated through e-auction and 58 have been allotted to Government Companies. With the implementation of RERA – The Real Estate (Regulation and Development) Act, home buyers are no longer at the whims of developers and their rights are strengthened and protected. There have been multiple labour reforms undertaken in last 4 years of the NDA government which are making the lives of the employees across India hassle free and easier. The unique UAN (Universal Account Number) allotted is saving the employees the hassle of running government offices for their PFs and ensures portability, even if they switch to multiple companies. Shram Suvidha Portal and an affirmative amendment in the Payment of Wages act (2017) have ensured formalisation and increased minimum wages to the working class respectively. The Indian economy, in last 4 years under the Narendra Modi led NDA government, has witnessed a strong growth trajectory and has improved on various international rankings. India’s share in world GDP was 1.75 percent in 2005 and increased to 2.43 percent in 2013, in a span of 8 years. But India’s share in world’s GDP jumped by a similar proportion to 3.08 percent by 2017, in a span of just 4 years. India's GDP grew by 8.2% in the first quarter of of the financial year 2018-19. It implies that India continues to grow faster than China. India’s forex reserves are also booming. Apart from strong economic fundamentals, India touched several milestones in the last 4 years. Moodys upgraded India’s ranking to Baa3 from Baa2 for the first time in 14 years. India jumped to 100th rank in Ease of Doing business index rankings-2017 from 142 in 2014. With the accelerated growth seen through the government’s relentless reforms, India will remain the bright spot in the global economy.